46233 heads for Crewe on a loaded test run from Derby, with 47760 at the rear of the train. After the boiler certificate expired in November 2010, the Duchess was taken out of service for a heavy general overhaul. It was back in steam towards the end of 2011 and had a successful main line test run 2 days before this test run. This entry was posted in Sharpo's World Photo Updates on March 30, 2012 by Sharpo. Earlier in the day the convoy had travelled from Cardiff to Kidderminster, where 50035 was shunted onto SVR tracks. Running as 0M50, 50049 then headed for Derby RTC with 37308 & 50044 in tow. The 37 was left at Derby & the 50s headed back to the SVR. Similar day to yesterday, Kidderminster to Arley for sandwiches, then on to Highley to try & see Bittern chimney first on the teak set passing the Engine House. All the visiting locos are seen in this set of photos, but conditions were quite hazy at times. Day 3 will follow soon, with some photos from a different location….. This entry was posted in Sharpo's World Photo Updates on March 27, 2012 by Sharpo. Day 1 of the Spring Gala. A misty start to the day at Kidderminster but 47406 on the goods was a pleasing sight. After sandwiches at Arley the next stop was Highley and the Engine House. All 5 visiting locos are seen, plus many of the SVR home fleet. This entry was posted in Sharpo's World Photo Updates on March 23, 2012 by Sharpo. 4464 is seen arriving at Kidderminster, having travelled from its base at Southall. After a long delay, due to the NR signalman having problems changing the points for the loco to cross to SVR tracks, it reversed off the main line. After a change of crew, the loco was moved from the exchange siding, uncoupled from support coach & turned in readiness for the Gala, which starts tomorrow. This entry was posted in Sharpo's World Photo Updates on March 22, 2012 by Sharpo. Couldn’t resist a quick visit to Walsall to see the 4 Class 56 locos being moved from Crewe. Hopefully some of these locos, or the ones moved a week or so earlier, will be returned to traffic. A few other freights are also seen. This entry was posted in Sharpo's World Photo Updates on March 21, 2012 by Sharpo. I haven’t done much with SVR photos in recent months, with the 2-train service it hasn’t been very exciting, but today 5 locos were in steam. Also seen were 69023 & 47406 outside the carriage shed at Kidderminster, hopefully much more will be seen of these visiting locos at the Gala this weekend. 56302 is a loco I had never seen, until today. It was working 6Z23 Burngullow to Burton with 47375 dead in tow. The two locos worked south earlier in the week from Burton, but these sort of workings don’t always run to schedule & by the time I knew it was running there was no time to get to Kings Norton to see it – the joys of using public transport! Sun at the wrong angle, but no other shot available. Follow the link above for a better going away shot. 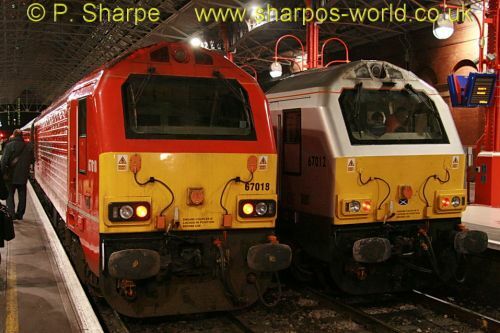 This entry was posted in Sharpo's World Photo Updates on March 9, 2012 by Sharpo. A Chiltern Trains £1 each way ticket offer from Birmingham to London tempted me down for the day. With a travel card for the underground trains I visited Stratford, Ealing Broadway, Willesden Junction & Paddington stations. Makes a change to see different multiple unit trains & liveries down there. Not many freights were seen, but did manage to photograph 67018 & 59206 in the new DB livery. 67012 was on the train back from London, it is nice to travel in a quiet coach with no engine under the floor! 67018 was on the Banbury train, 67012 on the Kidderminster. Colas are adding some Class 56 locos to their fleet. This working was to take 3 locos from Crewe to the scrapyard at Kingsbury, then later in the day the 3 locos for the Colas fleet were to be moved from Crewe to Washwood Heath. Unfortunately, the first working was about 2 hours behind schedule and I didn’t see the later move, which was mostly in the dark. The Class 56s I saw were 56058, 56032 & 56096. Also seen are some freight trains passing through Walsall. This entry was posted in Sharpo's World Photo Updates on March 2, 2012 by Sharpo.